NESCA News & Notes: If You Have a Child in Special Education, You Should Attend This Talk Tomorrow Night! If You Have a Child in Special Education, You Should Attend This Talk Tomorrow Night! 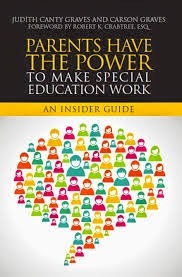 Last Call: Tomorrow, October 16th, from 7:00 - 9:00pm - Free book talk at NESCA with Judith Canty Graves and Carson Graves, authors of "Parents Have the Power to Make Special Education Work. ", with introductory remarks by noted Special Education Attorney Robert K. Crabtree. FREE and open to the public. Advance registration appreciated! Please call 617-658-9800 or email arenzi@nesca-newton.com.